This 69" Slipper Acrylic Freestanding Clawfoot Tub with Oil Rubbed Bronze Clawfoot Tub Filler Faucet and Hardware Package CTP51 is sold complete and is fully ready to install. This Freestanding Tub Package includes the Tub itself, the Faucet, and all other required hardware necessary for installation. Stop shopping and purchase everything you need all at once! Buy this package now and start enjoying your Tub within just a few short days. Using our 40+ years experience in the plumbing industry we have put together these packages to simplify the buying process. Purchase this package and get everything necessary for a fully operational Tub! This Bathtub package features a Tub Rim Mount Tub Filler Faucet with Handshower. Our goal here at Faucetlist.com is to make buying a Clawfoot Tub and the matching Hardware easy. Purchase this Bathroom Clawfoot Tub with Hardware Package today and save BIG! Kingston Brass Clawfoot Tub Fixtures represent cutting edge, precision design, and incredible prices! Get an amazing product at an amazingly low price! Order everything necessary to get your Clawfoot Tub ready for use with just a few clicks. 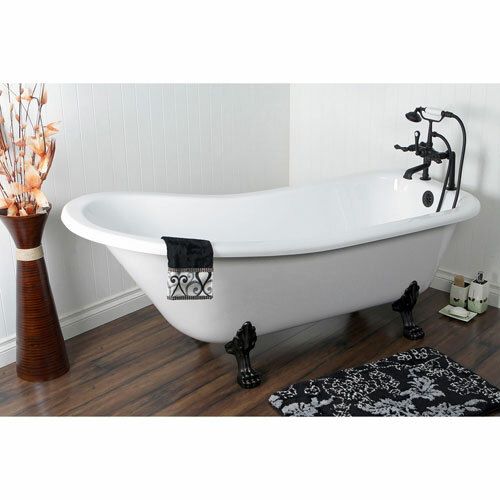 Buy this 69" Acrylic Clawfoot Tub w Oil Rubbed Bronze Tub Filler & Hardware Package CTP51 Now! This Tub with Oil Rubbed Bronze Finish Hardware Package features a Tub Rim Mount Tub Filler Faucet. This Package is completely ready to install. It includes the following items: 69" Large White Slipper Acrylic Clawfoot Tub with Oil Rubbed Bronze Lion Feet. Tub Capacity: 50 Gallons, Tub Weight Empty: 102 pounds, Tub Weight Full: 514 pounds, Oil Rubbed Bronze Deck Mount Clawfoot Tub Faucet with Hand Shower, Oil Rubbed Bronze Straight Clawfoot Bath Tub Supply Lines CC485, Oil Rubbed Bronze Clawfoot Tub Waste and Overflow Drain CC2095, Oil Rubbed Bronze (2) Hot and Cold Lever Handle Supply Stops. All Hardware comes in matching Oil Rubbed Bronze finish. Buy this high quality package today!